Data loss can strike at any time, and the cost of recovery will be high—unless you have a recent, usable backup. 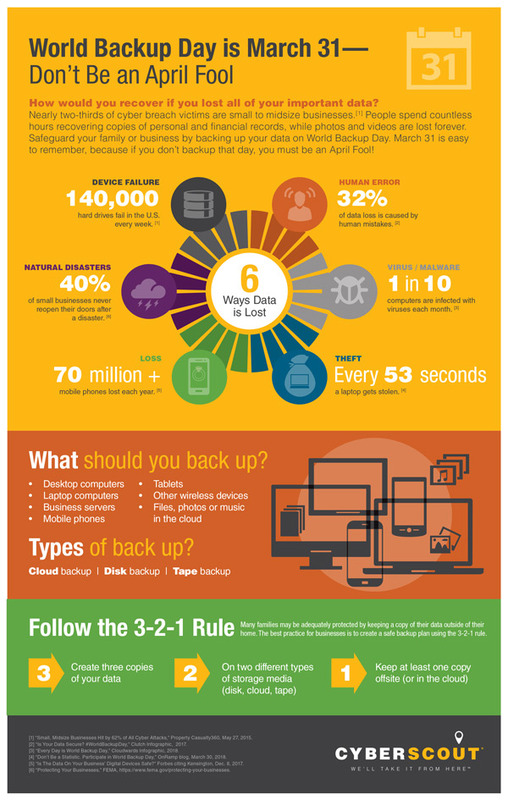 Take the first step to protect your data and valuable information by following the 5 Ws of backing up data—the who, what, where, when and why—on World Backup Day, March 31, 2019. “Backing up your home computer files is a safe and effective way to guard against all of your files from being lost whether due to fraud, a virus, or some other means. By considering how much you use your computer and how long you’ve had your computer (as some files you may have long forgotten about), backing up your files regularly protects information that may be irreplaceable,” advises Eric Russell, Fraud Analyst at Diamond Credit Union. Photos, video, or music files—including what is on phones and computers. Back up on a regular schedule. To determine frequency, think about how much data you create on a daily, weekly and monthly basis. Then decide how much you could afford to lose should disaster strike when you are between scheduled backups. Restored data is only as good as your most recent backup. For a family, backing up several times each year may be sufficient. If you take a lot of photos or work from home as a contractor or creative professional, consider backing up more frequently. Most businesses would benefit from an automated system for daily or weekly backups. Make at least three copies of your files and information. Create those backups on two different types of storage media—including USB drives, external hard drives, tape backups, or cloud storage. Keep at least one copy of your backup offsite, either in the cloud or safely in another building, a safe deposit box, or at another business location. Diamond Credit Union has partnered with CyberScout to offer comprehensive identity management services. If you detect suspicious activity or would like to proactively protect your identity, contact us at 610-326-5490 to be connected to a CyberScout fraud expert. (1)“State of Cybersecurity in Small and Medium-Size Businesses,” Ponemon Institute, 2017. (3)“Computer Backup Awareness in 2018: Getting Better and Getting Worse,” June 21, 2018. (4)“The DAM Book: Digital Asset Management for Photographers, 2nd Edition,” p. 207, O’Reilly Media, 2009, https://bit.ly/2CEF6Rt.